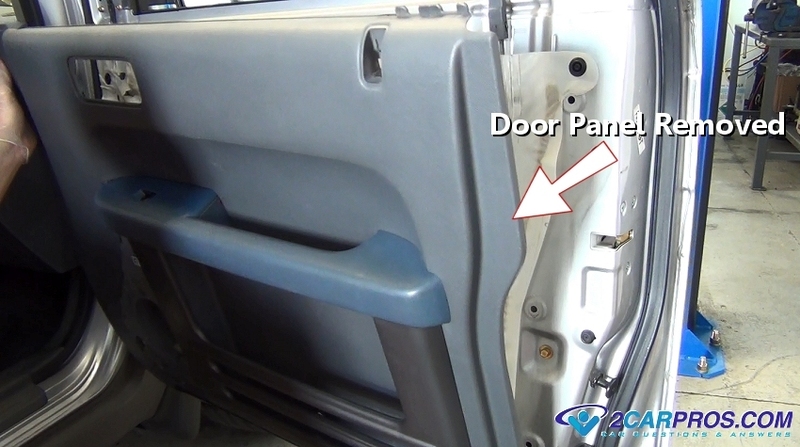 A door panel is used to cover the inside part of the door and hide the inner working of the door accessory's such as the window and door latch mechanisms. This padded cardboard item is held on by a series of screws and plastic clips that must be removed to service such items as a window switch, door lock and window motor and regulator. 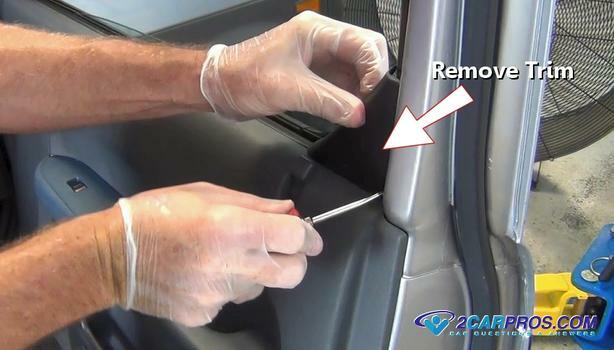 All door panels basically perform the same task though the process a door panel removal will vary slightly for each vehicle. In most cases a novice can perform this job. 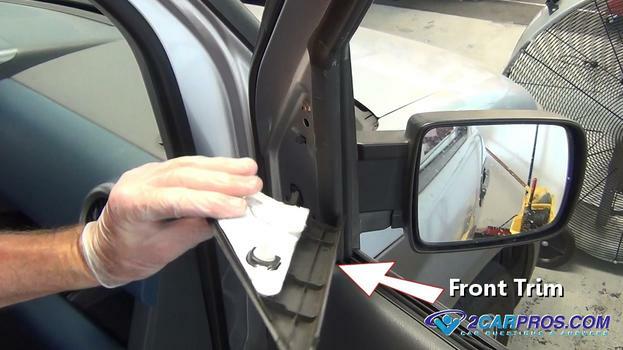 Once the door panel has been removed be cautious of how it is stored during the repair. Most door panels are made of cloth and can pick up dirt and stains easily. In most cases a door panel will have nothing wrong with it. 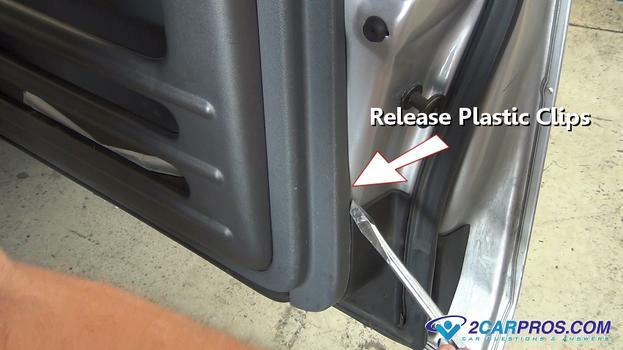 The reason for removing the door panel is to access other problems inside the door. 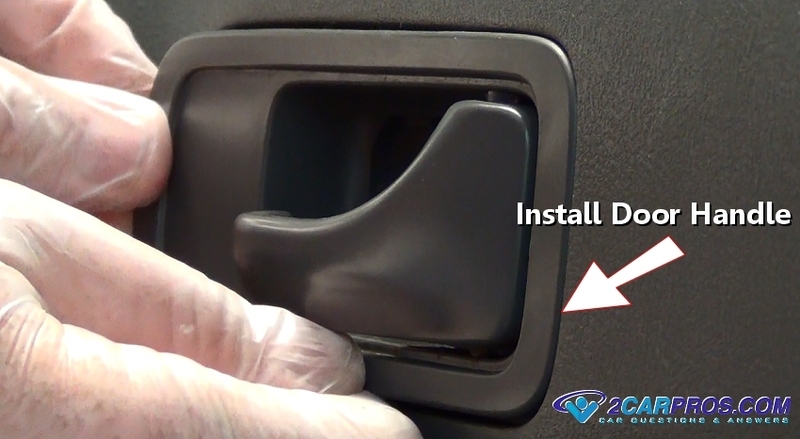 Once the problem is repairs the door panel can be reinstalled. 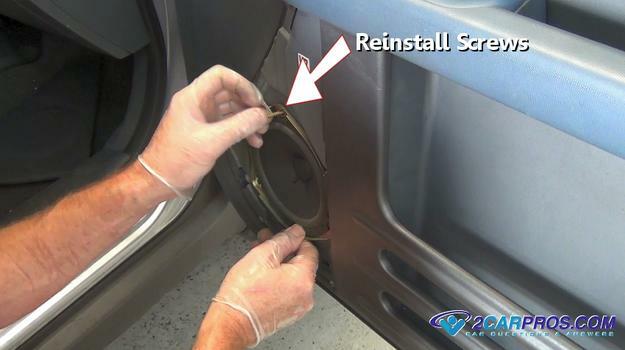 When you are taking you car into a repair garage or dealership to have the door panel removed it will cost between $55.00 and $95.00(US) depending on the design or manufacturer. 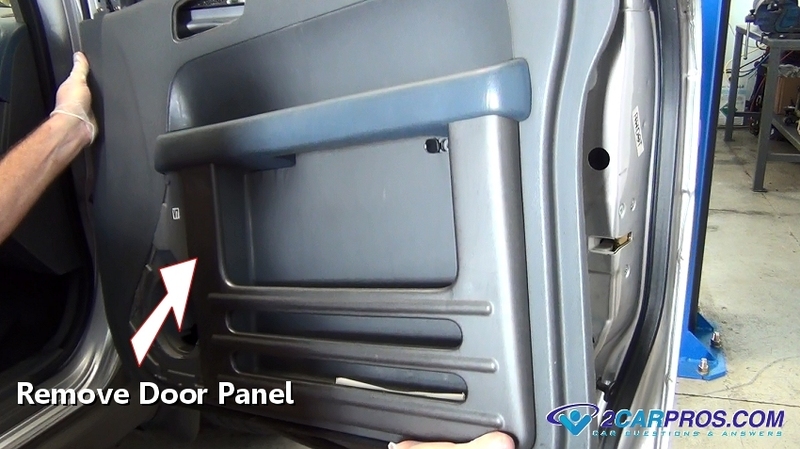 Most door panels will have small trim pieces located at the top of the panel at either the right or left side. 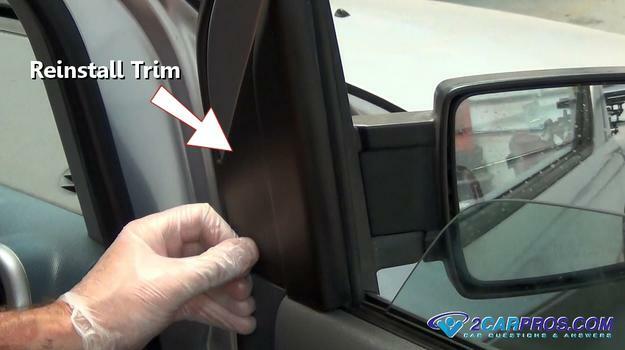 Use a small screw driver or trim removal tool and detach (pop off) any trim pieces above the door panel. Here is an upper trim piece to the left of the panel. These pieces must be removed before removing the panel. 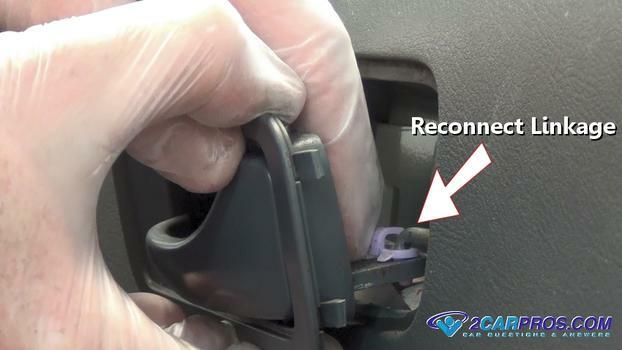 There could be a series of plastic fascia pieces that need to be removed which house the inner door handle, arm rest or window switch. 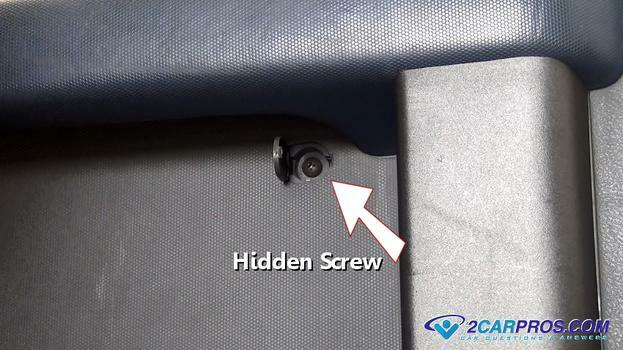 Look for hidden plastic covers which will need to be removed to access the hidden screws. 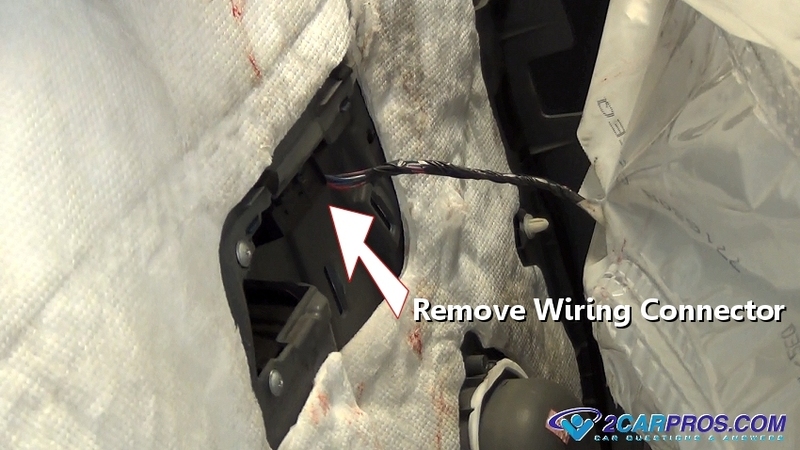 After all mounting bolt covers have been removed loosen and remove the panel mounting screws. These screws can be a little hidden so look around and under arm rests. Remove any screws holding the inner door handle. Grasp the handle and remove it by pulling upward. Be cautious of the linkage attached to the handle as not to bend or break it. 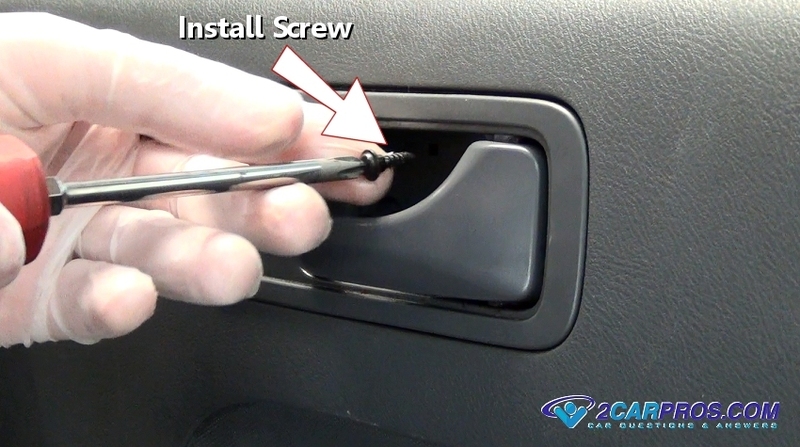 Use a small screwdriver to push the plastic clip over the linkage and release it from the handle. 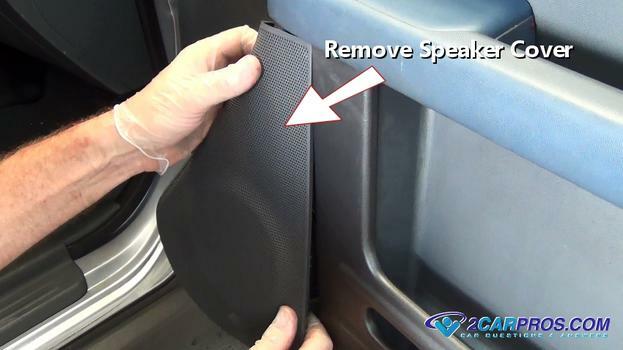 Some car door panels are equipped with a speaker which will need to be removed before the panel can be taken off in some cases. Grasp the speaker cover and gently pull outward to unclip the cover to access the speaker screws. 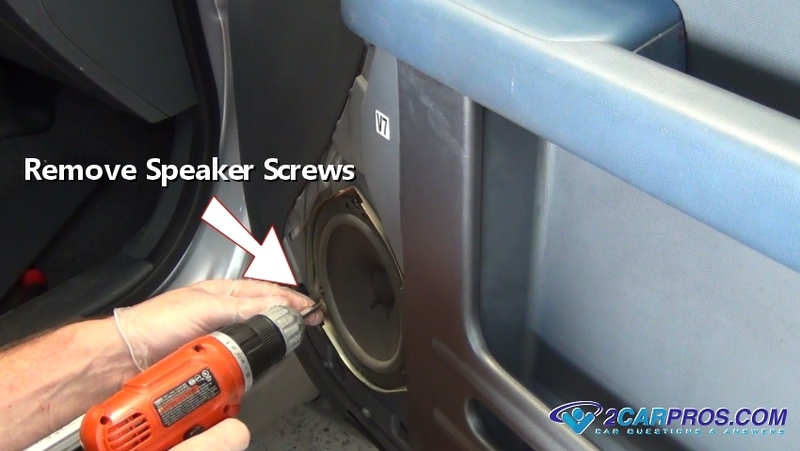 Remove speaker mounting screws to remove the speaker. Be careful not to puncher the speaker cone with the tool. 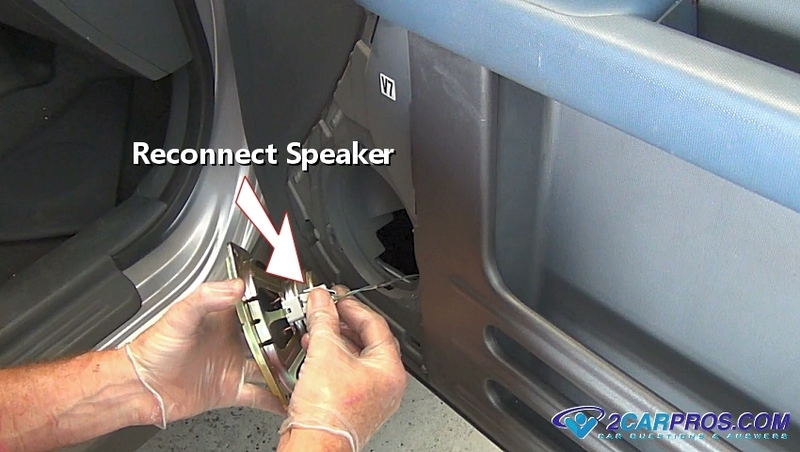 Once the speaker is loose disconnect the wire harness connector by releasing the wiring connector safety clips. Check that all mounting hardware and small hidden doors have been opened. Some screws can be well hidden as in the image below. Use a screwdriver or door panel removal tool and wedge it in-between the panel and the door. This will release (pop) the plastic clips holding the panel to the door. Follow this action around the bottom of the door until completely released. 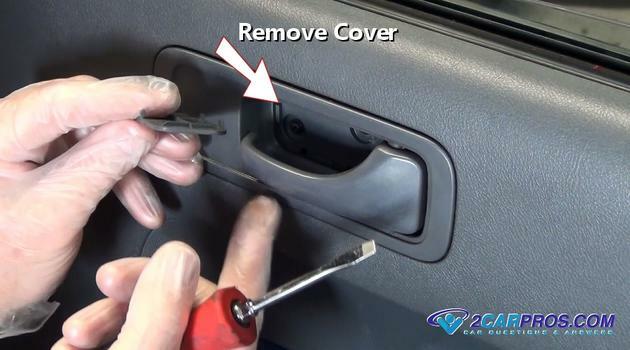 Once all mounting screws or bolts and plastic mounting clips have been released or removed lift up on the door panel to release it from the window sill. Hold it in place as wiring may still be attached at the rear of the panel. Locate the wiring connector to any accessories such as a window switch or light. Some window switches can be removed before the panel removal. Release the window switch electrical connector by pushing downward on the safety release clip. Once the electrical connector has been released the door panel will become free from the door. Remove it and gently place it away from the work area to keep it free from dirt and grease. 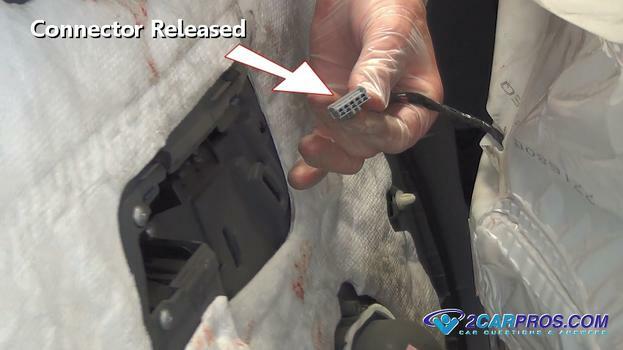 After repairs have been made and the door panel is ready to be reinstalled grasp the door panel and hold in position while reconnecting the window and door light electrical connectors. 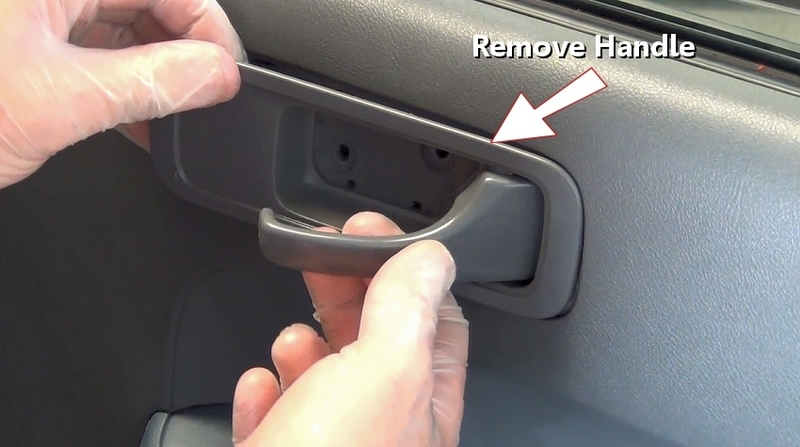 Make sure the latch control rods are safely in place and hook the door panel into the window sill and push down to secure. 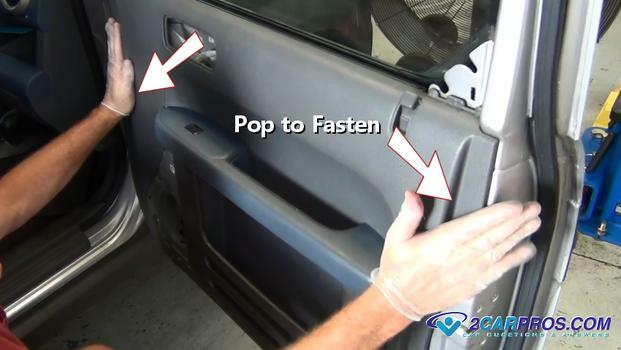 Once the door panel is secured at the window sill pop the plastic clips back into place. Physical alignment of the clips into their respective holes maybe needed. 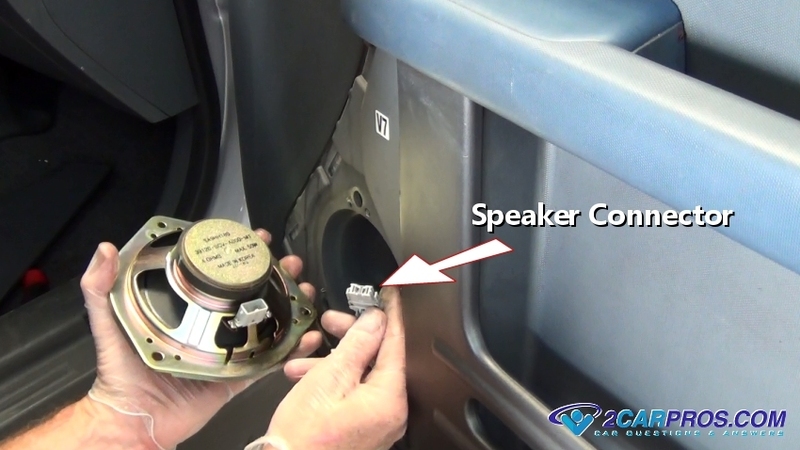 Hold the speaker while reconnecting the electrical connector and then set the speaker back into place. Reinsert and tighten speaker mounting bolts and reinstall the cover. 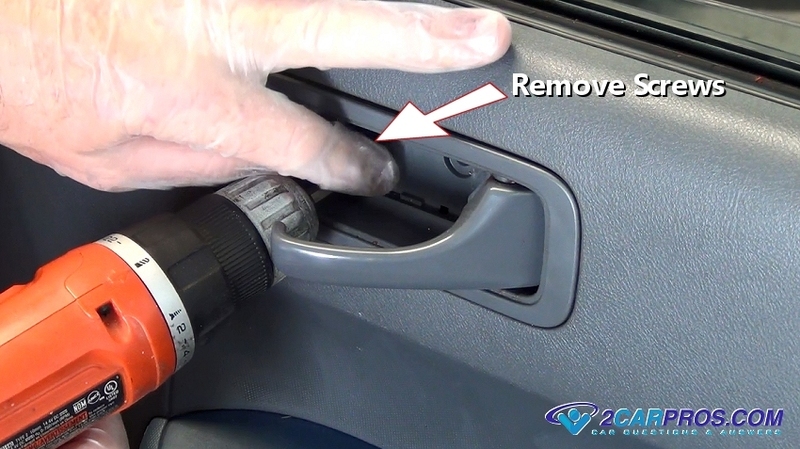 While holding the door handle reattach the door handle linkage by popping the plastic clip over the control rod. 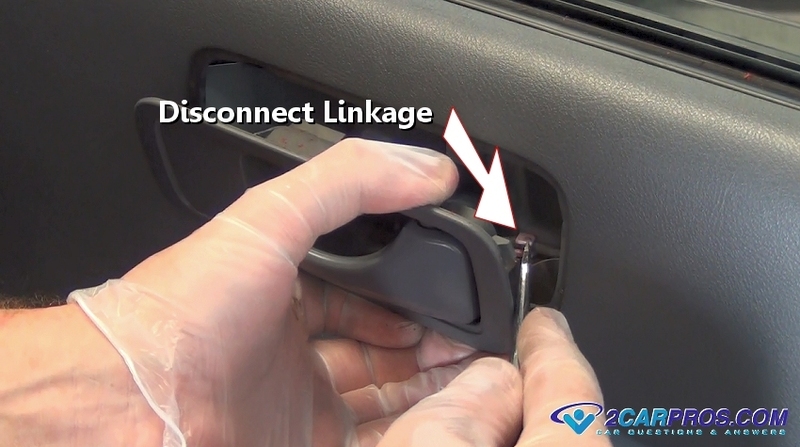 Snap the door handle back into place while ensuring the linkage can move freely. Reinstall and tighten the handle mounting screws. 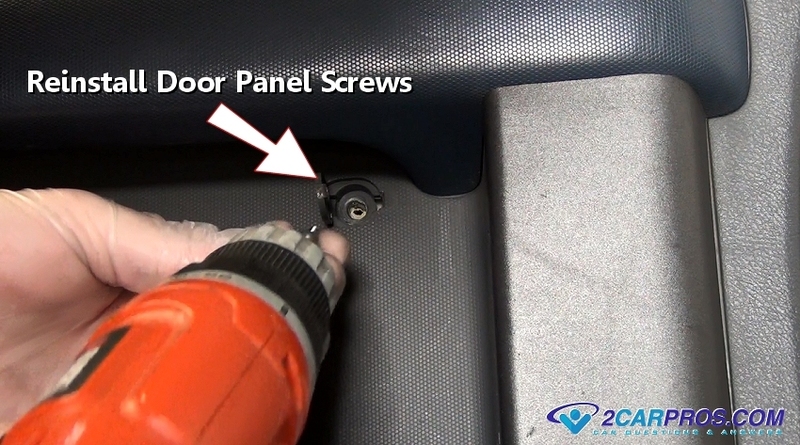 Reinstall all door panel screws or bolts and recover them with the small hidden plastic panels or doors. Once the door panel is properly secured reinstall the front and rear trim pieces and you are all set. Be sure the watch the video of the job being down below this image. 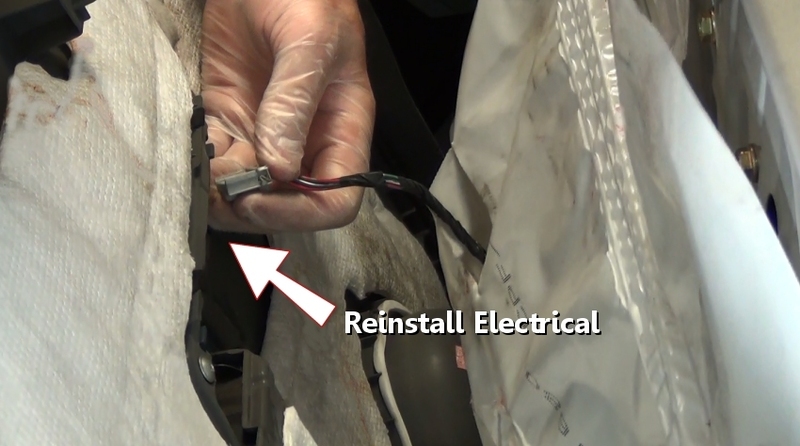 Check out this video of the job being done by one of our mechanics. If you have any door panel questions, please visit our forum. If you need car repair advice, please ask our community of mechanics is happy to help you and it is always 100% free.